Are you trying to design a room but having trouble choosing a color? Or, more likely, deciding on a color palette that works so well it looks like you hired a professional?! 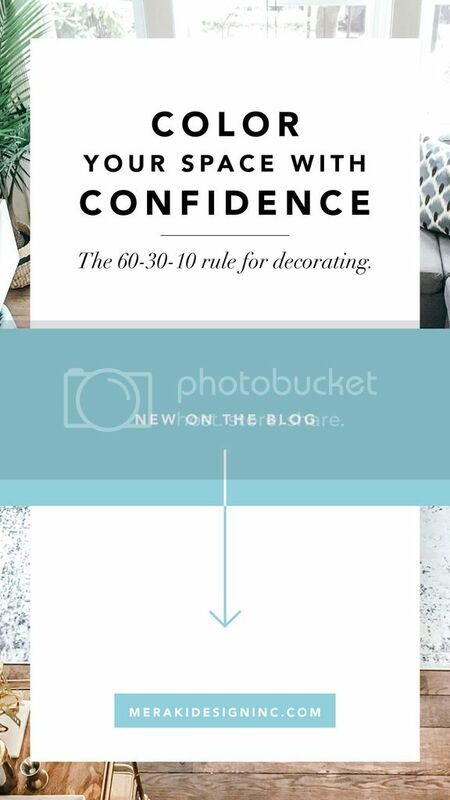 Well, I'm about to let you in on a little designer secret that is pretty much foolproof, even for beginner-level decorators. 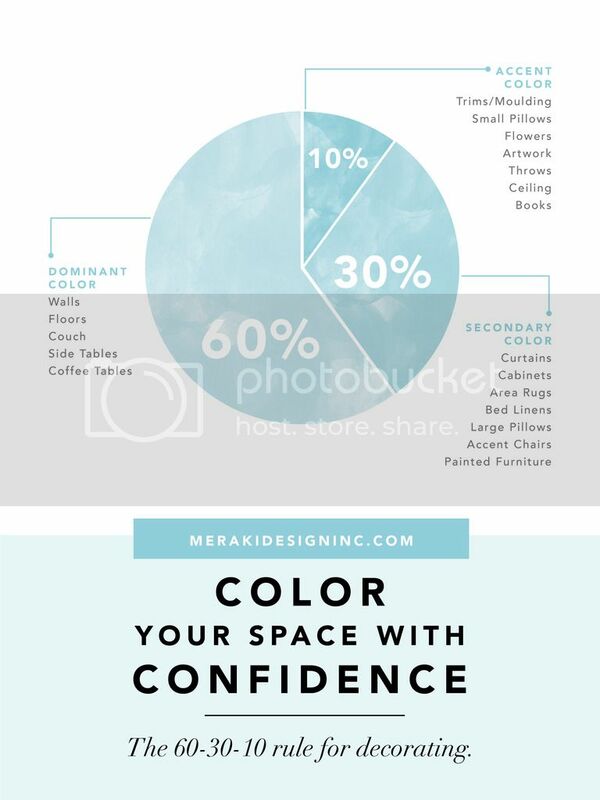 After following this trick you will be able to choose a color palette and decorate your room with confidence, knowing that your color scheme will be cohesive, balanced and completely Pinterest-worthy. Whenever I design a room, the second I’m done with space planning I utilize this general design rule that can be used not only for interior design, but also graphics, fashion, or artwork. It's the amazing 60-30-10 rule that is based on the golden ratio. This mathematical ratio was discovered by 20th-century mathematicians, artists, and architects and is believed to be a universally aesthetically appealing proportion to the human eye. 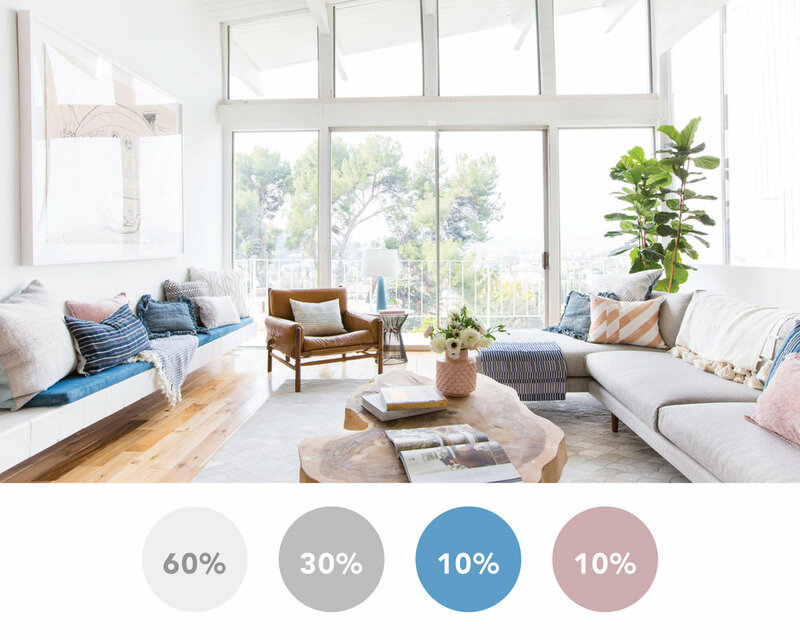 I start with a three-color pallet: a neutral, a secondary color, and an accent color (which is usually the boldest, or "pop" of color within the room). Applying these colors following the 60-30-10 rule will provide balance, depth and create a cohesive composition within your room. The first 60% provides the base and backdrop for the entire room. This color should be a neutral like grey, white or beige. You want to choose a color that will enhance the other colors you choose for 30% and 10%. This, of course, can be switched-up but if you are starting from scratch, this is a great rule of thumb. This color will be applied to the room about half as much as the dominant 60% color. This is typically another neutral or "pseudo-neutral." Pseudo-neutrals are colors that are dark or light enough that they function as a neutral - think forest greens, navy blue, pale blue or pale yellow. Lighter or darker versions of colors found in nature can usually be classified as a pseudo-neutrals. This is the fun part; the "pops" or accents of color within your room. Think bright accent pillows, books, or fun tchotchkes that you speckle throughout your coffee tables or book shelves. With this 10%, you want to make sure you are placing items evenly throughout the room, but not overloading to move past the 10%. Think of your room as a painting or piece of art, and how your eye would naturally move around the canvas from color to color. This 10% is going to be the color that moves your guests' eyes around the room. You want peoples' eyes to move fluidly throughout the space, moving from object to object that has your bold 10% color. Once you've mastered the 60-30-10 rule, you can also add a 2nd or 3rd 10% color and filter in sparingly. Think blue, green and yellow books and accessoires against a grey and white 60% and 30%. Do what feels right, our eyes are very intuitive, so if it feels "off" then that's a sign you went too far past the 10% and you need to remove or relocate certain elements of your design. All you need are a few designer tricks up your sleeve to get your place looking beautiful and curated. 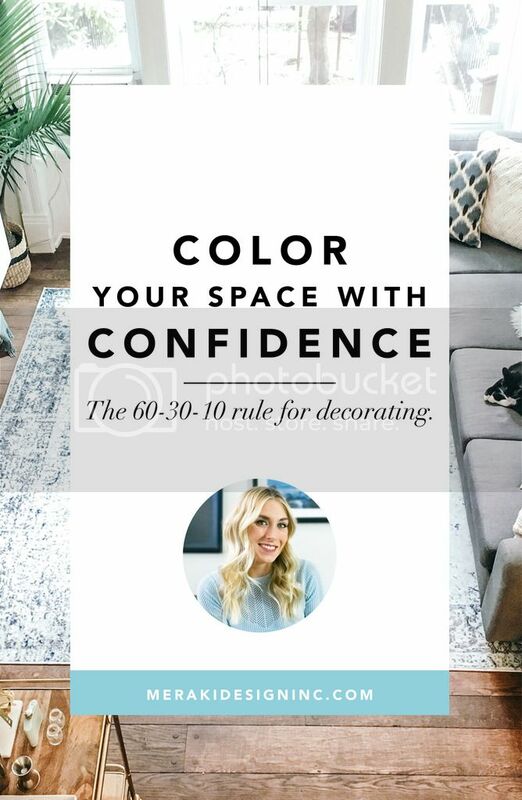 If you follow this simple rule for any room (or even any color combination in general - I admit I use the same rule when pulling together outfits!) you can achieve a room that is well balanced, aesthetically pleasing, and a place where people feel comfortable. Here's an example of my own living room following the 60-30-10 Rule! Get your regular dose of style, efficiency, and interior design tips right to your inbox!